Group 1�� Group 2�� Group 3�� Group 4�� Group 5�� Group 6�� Group 7�� Group 8�� Group 9�� There are 163 "Brilliant" rayon colors and 17 "Luscious" metallic colors in stock - so please browse until you find the color you want! Jenny's brand new 1100 yard spools of Rayon Thread are made in Japan exclusively for Jenny Haskins. Beautiful, high-sheen Jenny Haskins rayon thread is now available from Sew Creative Cottage. This 100 percent rayon thread is a premium-quality #40-weight thread that comes in 1,110-yard cone with a snap cap to keep the loose thread ends securely tucked under the cone. Jenny Haskins has endorsed many threads in the past, but has now developed her own line of threads, eliminating the hassle of locating the brand or colors she recommends in her books and magazines. This versatile thread has excellent tensile strength and is colorfast, dry-cleanable, and washable. It comes in 167 of the most popular colors. 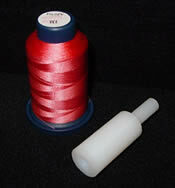 Jenny's thread is available as individual cones and also in money-saving packages. Packages include four eight-cone rayon sets and two three-cone metallic sets. 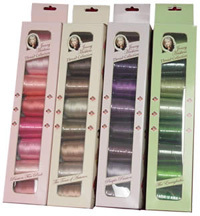 Sew Creative Cottage also has special thread sets available for specific Jenny Haskins books or projects. Click here for more details. Jenny's NEW Cone Adapter for Horizontal Thread Feed. Jenny's beautiful new rayon thread is available on 1,100 meter cones. These cones prefer to be sat on a thread stand and fed up and over your machine. However, some of us prefer to feed the thread horizontally on our machines. This is now possible with Jenny's new cone adaptor! Click here for more details.